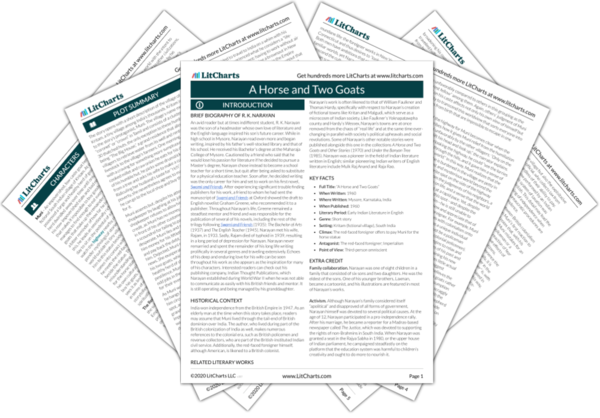 Instant downloads of all 946 LitChart PDFs (including A Horse and Two Goats). Welcome to the LitCharts study guide on R. K. Narayan's A Horse and Two Goats. Created by the original team behind SparkNotes, LitCharts are the world's best literature guides. A concise biography of R. K. Narayan plus historical and literary context for A Horse and Two Goats. A quick-reference summary: A Horse and Two Goats on a single page. In-depth summary and analysis of every of A Horse and Two Goats. Visual theme-tracking, too. Explanations, analysis, and visualizations of A Horse and Two Goats's themes. 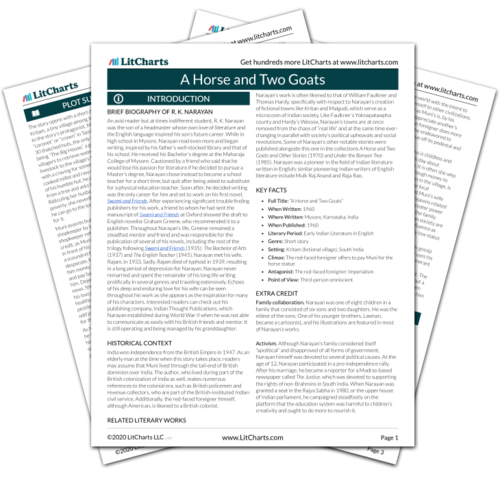 A Horse and Two Goats's important quotes, sortable by theme, character, or . Description, analysis, and timelines for A Horse and Two Goats's characters. Explanations of A Horse and Two Goats's symbols, and tracking of where they appear. An interactive data visualization of A Horse and Two Goats's plot and themes. An avid reader but at times indifferent student, R. K. Narayan was the son of a headmaster whose own love of literature and the English language inspired his son’s future career. While in high school in Mysore, Narayan read even more and began writing, inspired by his father’s well-stocked library and that of his school. He received his Bachelor’s degree at the Maharaja College of Mysore. Cautioned by a friend who said that he would lose his passion for literature if he decided to pursue a Master’s degree, Narayan chose instead to become a school teacher for a short time, but quit after being asked to substitute for a physical education teacher. Soon after, he decided writing was the only career for him and set to work on his first novel, Swami and Friends. After experiencing significant trouble finding publishers for his work, a friend to whom he had sent the manuscript of Swami and Friends at Oxford showed the draft to English novelist Graham Greene, who recommended it to a publisher. Throughout Narayan’s life, Greene remained a steadfast mentor and friend and was responsible for the publication of several of his novels, including the rest of the trilogy following Swami and Friends (1935): The Bachelor of Arts (1937) and The English Teacher (1945). Narayan met his wife, Rajam, in 1933. Sadly, Rajam died of typhoid in 1939, resulting in a long period of depression for Narayan. Narayan never remarried and spent the remainder of his long life writing prolifically in several genres and traveling extensively. Echoes of his deep and enduring love for his wife can be seen throughout his work as she appears as the inspiration for many of his characters. Interested readers can check out his publishing company, Indian Thought Publications, which Narayan established during World War II when he was not able to communicate as easily with his British friends and mentor. It is still operating and being managed by his granddaughter. 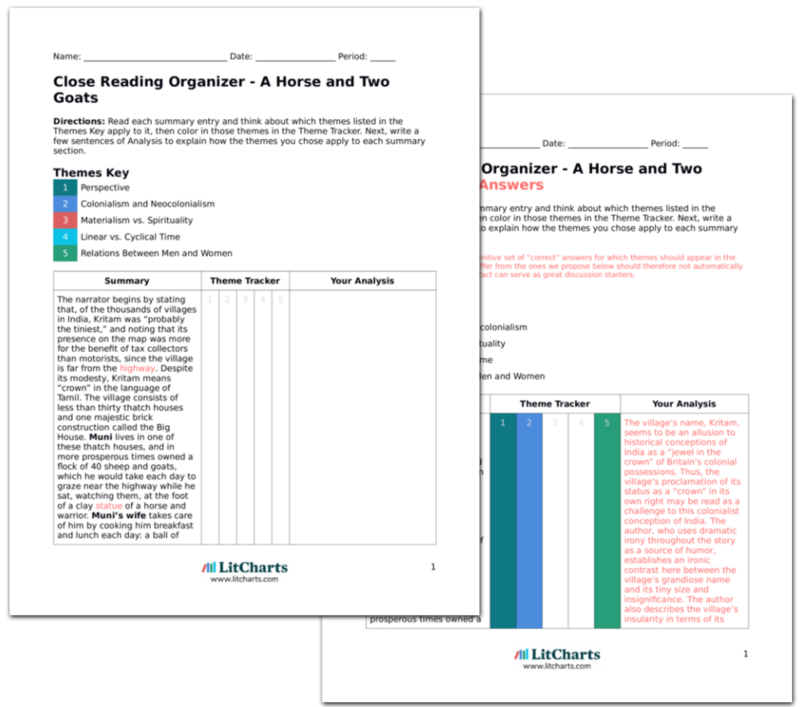 Get the entire A Horse and Two Goats LitChart as a printable PDF. India won independence from the British Empire in 1947. As an elderly man at the time when this story takes place, readers may assume that Muni lived through the tail-end of British dominion over India. The author, who lived during part of the British colonization of India as well, makes numerous references to the colonial era, such as British policemen and revenue collectors, who are part of the British-instituted Indian civil service. Additionally, the red-faced foreigner himself, although American, is likened to a British colonist. Narayan’s work is often likened to that of William Faulkner and Thomas Hardy, specifically with respect to Narayan’s creation of fictional towns like Kritan and Malgudi, which serve as a microcosm of Indian society. Like Faulkner’s Yoknapatawpha county and Hardy’s Wessex, Narayan’s towns are at once removed from the chaos of “real life” and at the same time ever-changing in parallel with society’s political upheavals and social revolutions. Some of Narayan’s other notable stories were published alongside this one in the collections A Horse and Two Goats and Other Stories (1970) and Under the Banyan Tree (1985). Narayan was a pioneer in the field of Indian literature written in English; similar pioneering Indian writers of English literature include Mulk Raj Anand and Raja Rao. Family collaboration. Narayan was one of eight children in a family that consisted of six sons and two daughters. He was the eldest of the sons. One of his younger brothers, Laxman, became a cartoonist, and his illustrations are featured in most of Narayan’s works. Activism. Although Narayan’s family considered itself “apolitical” and disapproved of all forms of government, Narayan himself was devoted to several political causes. At the age of 12, Narayan participated in a pro-independence rally. After his marriage, he became a reporter for a Madras-based newspaper called The Justice, which was devoted to supporting the rights of non-Brahmins in South India. When Narayan was granted a seat in the Rajya Sabha in 1980, or the upper house of Indian parliament, he campaigned steadfastly on the platform that the education system was harmful to children’s creativity and ought to do more to nourish it. Hyland, Rachael. "A Horse and Two Goats." LitCharts. LitCharts LLC, 22 May 2018. Web. 23 Apr 2019. Hyland, Rachael. "A Horse and Two Goats." LitCharts LLC, May 22, 2018. Retrieved April 23, 2019. https://www.litcharts.com/lit/a-horse-and-two-goats.